It was the first communal picnic of the season last weekend. Saturday saw torrential downpours across Sydney but Sunday was a perfect day for picnicking. We went to my favorite picnic spot, Nielsen park, which has the ideal combination of shade, shelter from winds, a 1920’s kiosk for coffee & ice cream and swimming. (Nielsen Park is a harbour beach, so no surf, but you can’t have everything even in the ideal) As we were walking back to our car, through the stately mansions and lush gardens of Vaucluse, a friend commented that we didn’t ‘really belong here’ but, as a Westie, I believe it’s our democratic duty to regularly invade the scenic beauty spots of the Eastern suburbs (or else rich people might begin to think they own the place). I spent the rainy Saturday making lime cordial and spicy tomato ketchup as Christmas gifts so I was a bit over cooking on Sunday. I did a dash to the Haberfield bakery and deli and made this simple grated beetroot salad as my contribution to the picnic feast. This recipe comes from River Cottage Veg Everyday! a gem of a book I’ve recently re-discovered on my bookshelf. In fact I made three salads from it over the weekend – new potato salad ‘tartare’ and an Asian slaw for a barbecue on Saturday night and this beetroot salad for the picnic on Sunday. Summer has arrived and it’s salad days again! Heat a small cast iron pan and toast cumin seeds until fragrant. Place cumin seeds in a mortar and grind roughly. Toast walnuts gently for a couple of minutes, stir often until nuts are golden and fragrant. Tip nuts onto a plate to stop cooking. Peel beetroot and grate coarsely (or julienne through a mandoline) Toss through parsley then dress with oil then lemon and orange juice. Season with salt and black pepper. Taste and adjust seasoning. Leave salad to marinate for about 20 minutes. Just before serving place grated beetroot in serving dish. Sprinkle cumin seeds over beetroot. 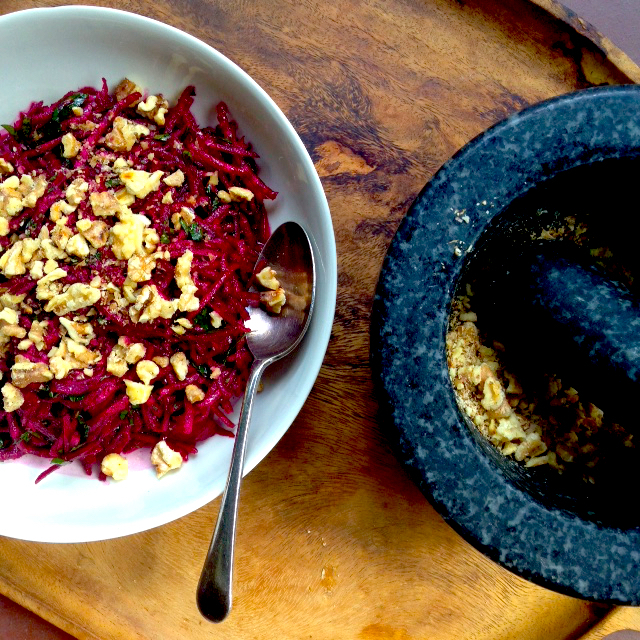 Bash walnuts roughly in mortar and scatter over beetroot.